I hate to admit it, but I’m getting kind of old. That’s not to say that 68 is really old, but I’m probably older than a lot of you who are reading this. I’m also 36 years old in “MS years.” I was diagnosed the month that Ronald Reagan won the Republican nomination to run for U.S. President, August of 1980, so I’ve had MS nearly half of my life. My MS and I have traveled down lots of roads together. Are there common mechanisms that older folks, like me, have used to handle our multiple sclerosis that younger MS patients can use to improve their own later lives? That’s what researches at Memorial University in St. John’s, Canada, set out to discover. They surveyed nearly 700 of us who are older than 55 and who’ve been living with MS for more than 20 years. The researchers then looked for common factors that allowed us to age relatively well, even with our MS. It’s hoped that learning from these experiences can help young and middle-aged people with MS live better lives as they grow older. Social connections was the most common factor that participants said contributed to their healthy aging. This included relationships with family, neighbors, and even pets. Activities outside the home that provided opportunities for social engagement were also highly valued. They included support groups, volunteer work, and community organizations. “My volunteer work with my dog and the hospital (patient advocacy) has kept me stimulated.” — 59-year-old woman from Quebec. “(I value) people close to me who accept my MS and give me all the encouragement and support that I need, plus allow me to do the activities that I wish to do and at my level and speed.” — 66-year-old woman from Nova Scotia. Attitude and outlook ranked second. Older people reported adopting ways of thinking that helped them cope with the challenges of living with MS. That included some very simple, simple things such as having a positive attitude and being optimistic. Determination and perseverance was also important. “Being determined has helped – I should have stopped work (teacher grade 1-3) five years before I did, perseverance.” — 64-year-old man from Ontario. Basically, this meant they took care of their body and their mind. It included eating healthy, getting exercise and adequate rest, managing medications, and using alternative therapies. It also meant doing things like a hobby, working, being outdoors, and traveling. Also mentioned as an important activity, and one that contributed to their sense of purpose, was searching for resources and information about MS. As someone who writes about MS, that’s good to hear. Not in the top three, but something that can’t be overlooked, is health care. We’re talking about the whole health care system here. Having access to high quality care was very important to respondents. People described high quality care as care that was prompt, reflexive, and appropriate. 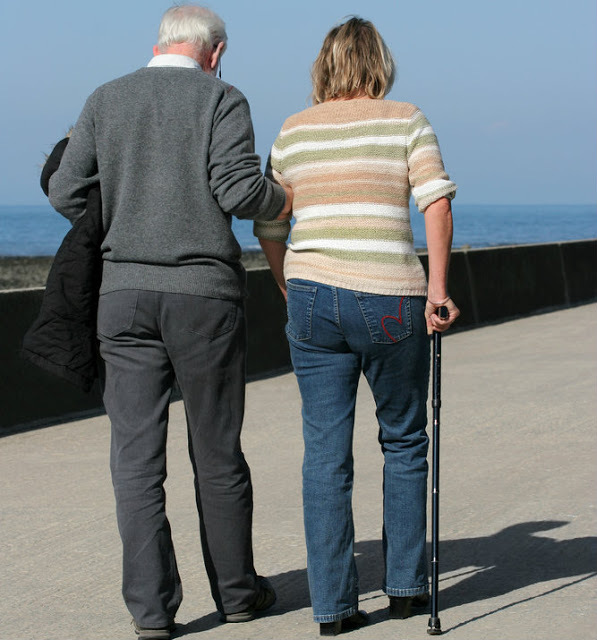 Older people with MS also highly valued relationships with their care providers. They valued health care professionals who listened to their opinions, acknowledged their feelings, and gave them encouragement. But there was also frustration with lack of access to treatment alternatives and bad experiences with some medical professionals.